As the leaves begin to change and the air gets a bit crisper, that’s how you know that it’s almost time for Thanksgiving. Thanksgiving in United States – Thanksgiving in the US always falls on the fourth Thursday in November. 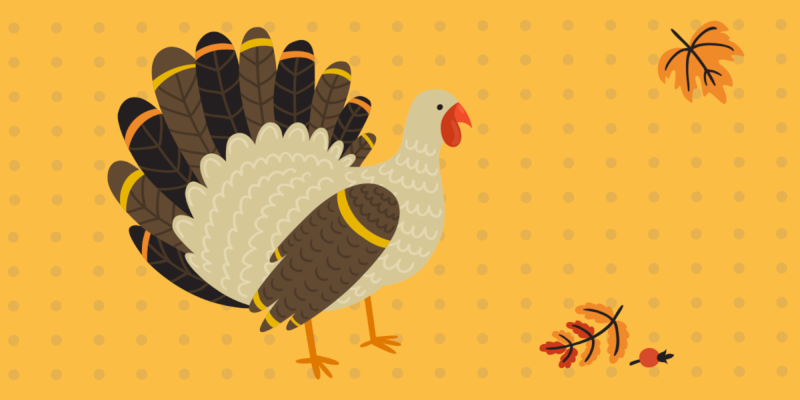 Since it falls on the same weekday (Thursday) but a different calendar date each year, you’ll often hear people asking what the date for Thanksgiving is this year. If you find yourself wondering, “When is Thanksgiving 2018?”, in 2018 Thanksgiving is held on Thursday 22, 2018 in the United States. Canadian Thanksgiving – You might not know that Thanksgiving is celebrated on different days in America and Canada. Well, Canadian Thanksgiving falls on the second Monday of October, so in 2018, Canadian Thanksgiving is on October 8, 2018. As it’s more than a month before U.S. Thanksgiving, it can be confusing when Thanksgiving is sometimes. Often people forget to explain which Thanksgiving they are talking about, which can lead to even more confusion. The best way to remember it is that Thanksgiving is in the fall, and the date changes every year no matter which country you are talking about. One of the biggest parts of Thanksgiving is (as the name implies) giving thanks. It is a time where you are supposed to gather with others and reflect on the good things that are happening in your life. There are many different ways to celebrate this important holiday. Many families have developed yearly traditions that they used to help honor the occasion. There is also a newer trend of friends gathering together and celebrating what has come to be known as “Friendsgiving.” No matter how you choose to mark the day, remember to let those around you know how thankful you are to have them. What are you planning to do to show your family and friends that you care this Thanksgiving? Call Your Loved Ones – It’s always nice to hear the voices of those that are dear to you. Make sure to give them a call and see how they are doing this Thanksgiving. If you don’t want to interrupt their celebration, schedule a time before or after Thanksgiving to catch up. It doesn’t have to be anything formal, just a quick call to share your greetings. If everyone is together, they can pass the phone around so that you get in touch with everyone at once.? Send a Card – This is a simple way to show everyone you care. Thanksgiving cards are a great option to tell everyone near and far that you are thinking of them this Thanksgiving and you are grateful to have them in your life. Even if you are planning on spending the holidays together, you can send them a card to let them know you’re excited.? Schedule a Video Chat – Can’t be with the people you love? Through technology, you can virtually attend Thanksgiving, even if it’s just for a quick hello! If you live abroad or cannot make it to every Thanksgiving dinner this year, you can video chat and see how everyone is doing.? Send a Treat – If you’re far away, you can still get in on the fun. You can bake something like pumpkin bread or cookies to add to the Thanksgiving table. You can also choose to send something from an online store like a pie or appetizer. If you are certain their table will be overflowing with food, send a flower arrangement! Do something to brighten their day and let them know that you are thinking about them. There are so many ways to celebrate Thanksgiving. From hosting a big dinner to giving back to your community, Thanksgiving is a time to create happy memories. Here are a few fun ideas for you to consider this year. Host Thanksgiving Dinner – Are you confident in your Thanksgiving Turkey baking skills? Show them off by having everyone over to your house for the big day. It is a wonderful way to create happy memories in your home and show your friends and family how much you care about them. Have a Potluck – Even if you aren’t a turkey baking professional, you can still host the dinner at your house. Gather your loved ones and have them help to make the best dinner by allowing everyone to bring something that they enjoy making. They can bring Thanksgiving Side dishes to help create a full feast on the day. Some common side dishes are mashed potatoes, stuffing, cranberry sauce and sweet potatoes. Host a Bake-Off – Enjoy the holiday with a side of competition. This is a bit of a twist on the traditional potluck. If you have a big group of cooking enthusiasts coming together for Thanksgiving, create a challenge for the day. Break the meal into groups – appetizers, sides, and pies (with turkey being the main dish). Have each person pick a category and make their favorite dish. The winners in each category win bragging rights and perhaps an exemption from doing the dishes that day.? Watch Home Movies – Thanksgiving is a time to reflect on the good things in life. Breaking out the home movies will remind you of all of the happy times you and your family have shared. It's also a great way to wind down and relax after you've eaten your fill of the fantastic food.? Volunteer – This is an excellent time to give back to your community. There are many ways to volunteer during Thanksgiving. Talk to your local food bank and see what they need. Many families cannot afford the ingredients that make up a holiday dinner, and you can help to change that. You can also volunteer to work at your local homeless shelter or serve food at a soup kitchen to help others to have a happy Thanksgiving. Whatever you choose to do this Thanksgiving, remember to spread kindness and good cheer. Bring your family and friends together, think about all of the happy times you have shared, and enjoy a fantastic meal together. Carving out one day a year to relax and come together is what Thanksgiving is all about. Happy Thanksgiving!